I wanted to share my experiences learning the violin so far, the obstacles and struggles, and the happiness it brings. As some may remember I had acquired an old violin that used to be my great grandfathers and was debating on fixing it up. I decided to cut my own bridge following the instructions found here, put new strings on it (Preludes), and I purchased a $30 dollar bow from a shop and a $5 dollar bow from amazon. I had a very hard time at first getting good sound, but as time has gone by I have come to find I prefer the sound of the $5 dollar bow (surprising to me). It took me quite some time to determine how I can most comfortably place the violin to get the best sound and to reduce fatigue of the arm and fingers. 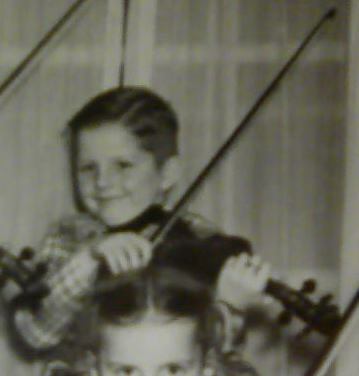 My fingers do not move as fast as they once did but I am getting better with the violin being my exercise equipment. I have been using some music from Fiddlerman, Rubank Elementary Series, and Old Time Fiddle for the Complete Ignoramus. I can see progress in my playing ability each week, and usually find an adjustment to stance, position, and bowing. Sometimes the new position sets me back a bit but I come out further ahead by the end of the week. 1. Switching strings can sometimes be hard, mostly due to my timing of string release and presses. Also fingers ever so slightly touch the string I am going to creating those undesirable sounds. 2. Still have some scratchy sound when I play slow, I am wondering if bow quality may have some part, but I am going to keep trying and working at bowing to see if I can fix it. Well I think I have run-on long enough, I thought that this was the best topic for this, sorry if it isn't. @jasoncheers: It's a great topic, thank's for posting it. @jasoncheers: Great post. We've all fought or continue to fight the same battles. Scratchy might be helped by a new bow, but the main thing when you hear scratchiness is that you are either 1) pressing down on the bow too hard or 2) moving the bow too slowly. You can move the bow slowly or you can press down a bit, but you can't do both at the same time without scratch. I was the crown prince of scratch for a while, until I noticed that I was pressing way, way too hard and I still do, if I don't pay attention. I used to produce chronic scratch with a method I alone may have invented. It is the knack of dragging the bow to another sounding point on the string(s). The horizontal motion on the strings creates a really bad racket. Of course, the vertical bow component makes the music but the scratch comes first and this is easily heard by the audience. From my experience with students who haven't been playing that long and get a scratchy (ponticello) sound, 9 times out of 10, they are playing too close to the bridge. When you use the contact point which is closer to the bridge you need more downward bow pressure to equal the lack of free vibration which the bridge causes by holding those strings. Often a new players bow wanders from close to the bridge to far away from the bridge with no determined contact point. This is caused by not drawing the bow straight. I use angled bowing in one direction and the opposite angle in the other direction just to bring my bow to the point I want at a specific time so bow angles can really move the position of the contact point drastically. As a beginner, try to learn to draw the bow as straight as possible with a contact point that is approximately half way between the bridge and the beginning of the fingerboard. Next most common reason for that sound would be lack of bow pressure. If the bow doesn't press down enough to actually grab and pull the string it will glide over the string making a strange sound instead. You need just enough downward pressure to keep a constant and consistent vibration going similar to when one circles their wet finger on a crystal glass to make a tone. If one doesn't use enough pressure the glass doesn't vibrate to produce the sound. Lastly, make sure your left hand finger tips actually do touch the fingerboard. Too little pressure won't give a good anchor adequate to produce good vibration. Compare your sound to an open string as an example of how easily the strings vibrate when securely anchored vs your fingers. There is this story that I heard when doing a master class with Dorothy Delay back in the days about a famous soloist who revisited her and complained about his sound production (Don't remember the name of the soloist but it was an extremely famous one). She simply said, "didn't you used to use more left hand pressure?" The soloist simply applied slightly more pressure and the fantastic juicy rich sound that he had lost came back. He got so comfortable with his playing that he forgot to weight any importance on degree of pressure. It's also bad to press too hard but not because of sound production, rather for your fingers, vibrato, flexibility and future hand and finger issues. Good luck and thanks for bringing up the issues at an early state.